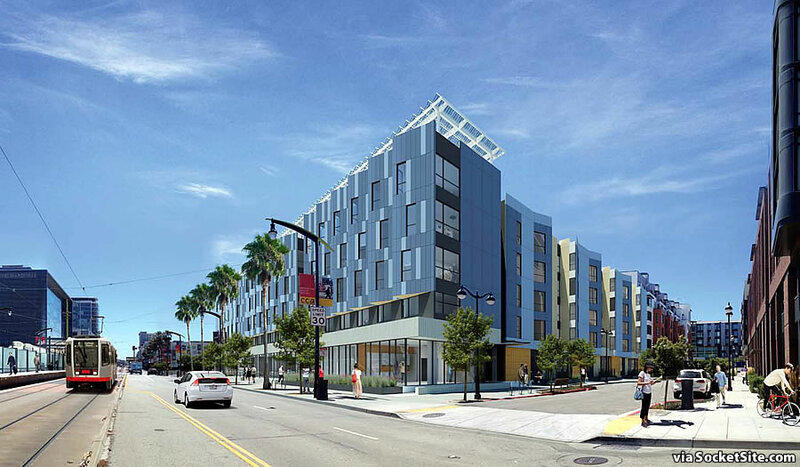 A 75-year ground lease for the eastern half of Mission Bay Block 3 which fronts Third Street, between Mission Rock and Long Bridge, is slated to be approved next week. Financing is expected to be funded next month. 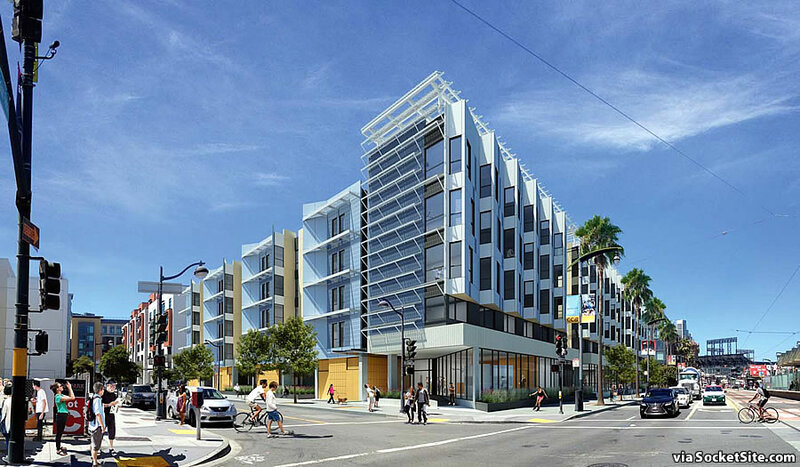 And the construction of a five-story building with 119 below market rate (BMR) apartments to rise at 1150 Third Street is expected to commence as soon as the funds are secured. As designed by Leddy Maytum Stacy Architects for the Chinatown Community Development Center and Swords to Plowshares, the project will provide a mix of 62 studios and one-bedrooms for formerly homeless veterans and 57 units (a mix of one, two and three-bedroom units) for low-income families earning up to 60 percent of the area median income, with on-site supportive services, a landscaped central courtyard and a garage for 24 cars and 72 bikes. The apartments will range in size from 371 net square feet for the smallest studio to 1,050 square feet for the largest three-bedroom. 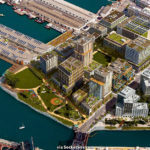 And the development will cost a budgeted $80.2 million to build, which doesn’t include an accounting for the value of the land which will effectively be leased at a base rent of $15,000 per year but does include a $3.5 million fee for the development team. And if all goes as planned, the building should be ready for occupancy by November 2019. The ground underneath condos to be built is leased? From whom, the city/county? The land will effectively be leased from the Mayor’s Office of Housing and Community Development. And as reported above, the development is an apartment complex, not condos. So much for these developers being “non-profit”. I can’t wait to see what this complex looks like 5 years from occupancy. All the articulations, nooks, crannies, will be very difficult to clean (i.e. won’t be cleaned ever), the balconies will be a disaster (picture every balcony with dead plants, bikes and a Dish). Hope I am wrong. Will there be annual means testing, so that these BMR units are actually leased to people in need, not those that were once in need but are no longer. Is $488/sqft for construction costs high or low? I was quoted $500 a square foot by a longtime SF-based contractor, so I’m guessing that’s right for SF. Compared to the rest of the US, I’m sure that’s very high. What’s with the “serrated” bay window trope? Can anyone just do a simple, straightforward, familiar, classic, 3-sided bay window anymore? And $488/sf isn’t penciling out for market-rate projects — $400/sf absolute/extreme max. is more like it. Maybe the serrated bays are a reference to the saw-tooth factory roofs of former industrial areas? They also provide more privacy from neighbors’ bay windows than rectangular bays, the side windows of which look directly into each other. So the actual value of a new BMR 1 bedroom unit is around $674k + land cost, or about $1M per unit. If for sale, they go for something like 500K? So the subsidy is about 500k per unit. No first floor retail? 3rd desperately needs activation. There’s a T stop right here, but nothing at all to do. Unlike Fourth Street, Third Street was never intended to be a retail corridor. And programming for affordable developments typically focuses on services for the community that otherwise wouldn’t exist (such as the future community room fronting Third Street). As we know from western SoMa height limits, City plans, dear SocketSite editor, are not always wise. This is where people wait for and get off the T train, so there should be activation here — something to see and do. And retail in affordable housing isn’t a contradiction in terms. See the Rich Sorro Commons just up the street at 3rd and King. Thriving restaurants and shops line its King Street frontage generating revenue for Mission Housing programs. Likewise Reveille Coffee, Tadu Ethiopian, Casey’s Pizza and a picture framing place are based below the Mercy building at 4th and Long Bridge, which has a community room as well. I’m glad a supportive housing project is moving forward but there’s no reason this couldn’t be a floor taller with services on the second floor and ground floor retail to both defray the cost of services and activate the area. Missing that opportunity is poor planning typical of Mission Bay’s redevelopment, and compounds the deadness of that stretch as we wait for the Giants to finally replace the parking lot across the street. Who is paying for this? I assume its all of us. If land costs were included the total would be 1M per door just for developing the units. That does not include the real estate commissions, marketing costs and profit that a market rate deal also has to absorb. I agree with some of the comments. The costs are outrageous. Somebody is pocketing some major change on the taxpayer’s dime. With 6,000+ people living on the streets in SF – with more all the time – it is clear that projects that cost $650k per unit are not a solution to the housing crisis. What if we were talking food not housing? We have 6,000 hungry people. The City would feed 120 of them fancy 10 course dinners at 5 star restaurants and let 5,880 of them starve…. Our public policy solutions are a cruel joke to the very many not helped. They only make sense to politicians at City Hall. Contact your supervisor and ask them to take up Panoramic’s offer to build modular homeless housing, then. And pass city-level streamlining for 100% affordable developments. Doing the same thing over and over while expecting different results is getting us nowhere. Update: according to an attendee of the YIMBY Awards Gala last night, Jeff Sheehy announced he’s submitting legislation to make 100% below-market-rate developments by-right. I had no idea this was coming when I wrote the above comment, but assuming the details are good and it passes, there’s half of what I suggested. Yes, the entire ground floor should be retail, to fund the ongoing building costs (and other BMR projects?). Perhaps the planners didn’t notice all those rich people standing around out front every day, waiting for a (late) train, with nothing to do but stare at their phones and each other. The proportions look agreeable, or at least consistent within the context. Its west and north faces could likely have had an extra floor, casting nary a shadow on the sunny foreheads of pedestrians below. It remains to be seen how these particle-board/aluminum/stucco luxury residential blocks look in 10 years. Inevitably 3 years after they open they are sheathed in scaffolding. All the stucco is stripped off – bits of particle board growing black mold replaced – the few bits of aluminum detailing are not replaced in the name of waterproofing – some orange or yellow paint highlights added – and the architects declare victory. I see this premature re-sheathing task occurring frequently on condo projects. Oddly it seems to rarely occur on similarly constructed apartment projects. I’m not sure why owning vs. renting would make a difference in how aggressively these mitigation projects are pursued. Even apartment buildings have owners. 1. Renters often do not complain because they do not want to get evicted. 2. The apartment owners do not want the hassle of displacing tenants to do work tenants don’t want. 3. Apartment owners have different insurance than Condo owners. why are we only building to 5 floors? Wouldnt it be cheaper per unit to go to 10, and it would look perfectly fine to do that here. why do we continue to underbuild? 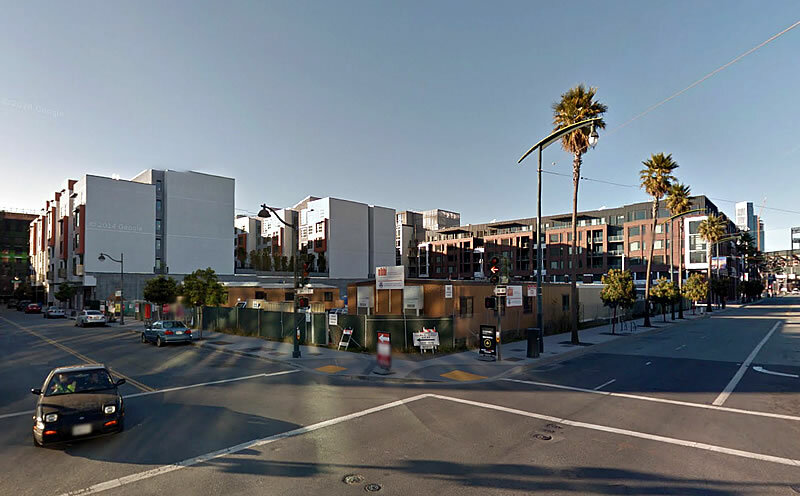 Another Emeryville like ugly building rising in SF!